The huge storm back home in Newfoundland got me thinking about how nice it is to be hunkered down with a nice wood fire when a raging blizzard blows around outside. There was always just something different about the heat, hearing the wood crackling and popping. When I was younger, most everyone had an old wood range similar to this one in their kitchen, with a wood box nearby. I can still remember the names things had, damper, lifter, poker. We’d open up the firebox either with the damper on the top, or from the door in front to feed in wood and slabs. The oven would be stogged with bread baking nearly every day, and water on the side in the tank staying warm for washing, or whatever else. The kettle was always on, and always full, and ready for a cup of tea, and underneath the oven, our ski-doo boots would be warming or drying after we’d come in from sliding on the old coaster, or making forts and tunnels in the drifts. Up top our mitts and socks and vamps would likely be drying in the warmer. One of the dampers often had multiple rings, and we’d have one open with the old wire handheld toaster over the top, toasting some of the fresh homemade bread and coating it with butter and molasses. 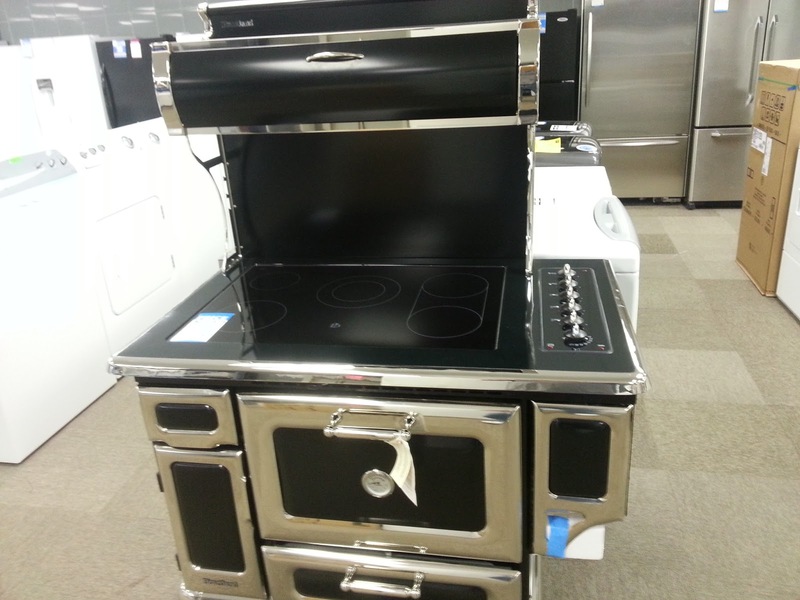 Seems like others remember too, I saw this range when I was looking at appliances this past fall. Nice to be able to keep the old alive with the new, though a bit out of my price range. My first time in Newfoundland, there to stay with a girlfriend and her family, we lost power in the area I was staying (Bay Roberts/Harbour Grace/Carbonnear) for 8 days! It turned out to be a great way to meet my potential in-laws, since all the stores and schools were closed and we just played tons of cards (learned Cribbage) and visited. Best of all, we were very comfortable, since they had an “old wood stove”, which kicked out a lot of heat when fully stoked. We were also very cozy, since we ended up each night sleeping on mattresses and blankets all around. Also, while many were finding food a real challenge, we had fish n’ brews breakfasts, soups for lunch and a roast or turkey almost every night. Of course, being Newfoundland, we spent most of our afternoons dropping in on neighbours to make sure they were doing ok and bring piping hot soup, hot chocolate, etc. All made possible by the Old Wood Stove! Ah yes, nothing beats the ambiance of an old wood stove, radiating heat on a cold winter’s day. It just feels “right”. Good little nostalgic piece you wrote here! Thanks! Just had a glance at your blog as well, will have to read more when I am not exhausted! I love the grill! The one we had on Red Island could do oil, coal and wood. We mostly burned coal. The boat would drop it off at Mr. Jim McCarthy’s wharf and it would be hauled around the harbour on the same hand barrows used for fish. Hard way to do it!